In the last post we looked at what to expect after teams experience a ‘Second-Year Surge’. Now I want to examine the aftermath of the opposite—the ‘Second-Year Stagnation’. Sometimes a coach steps into a great situation in his first year on campus. Perhaps the previous coach left the cupboard fully stocked, maybe the schedule was unusually easy, or maybe the team just experienced a great deal of good fortune. 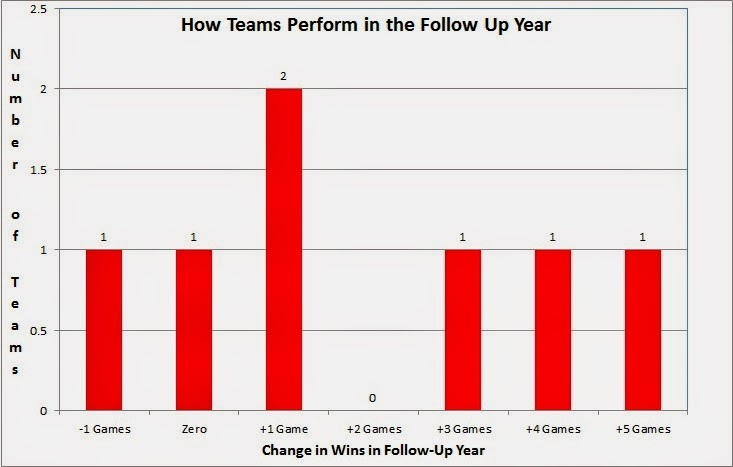 Then, in Year 2, when fans and administrators expect continued success, the team regresses. Perhaps star players graduated, maybe the team experienced an influx of injuries, or the new coach didn’t recruit very well. Whatever the reason, the team stagnated, and now the coach finds himself in need of a rebound to keep his job. In the macro sense, what are his prospects for a rebound? To answer this question, I looked at the results of all FBS coaches who debuted at a school from 2005-2012 and set the arbitrary definition of ‘stagnation’ to a decrease of at least three regular season wins. If you recall, I used four wins as the baseline for a ‘surge’, but frankly, if we use four wins as the baseline for stagnation, we won’t have very many teams to examine. Using three wins as the baseline yielded nine teams. They are listed chronologically in the table below. The table includes the record in the coaches’ first year, second year or Stagnation Year, and third year or Follow-Up Year. The Dif column is the difference in the Stagnation Year and the Follow-Up Year. Stanford and Temple are color-coded differently because their coaches left after the stagnation (Walt Harris was fired and Steve Addazio took a better job), so they are actually coached by a different guy in the Follow-Up Year. You’re an adult. You can view the table and judge for yourself, but I will throw out some averages for you. In the ‘Follow-Up Year’, the nine teams that ‘Stagnated’ improved by an average of 1.5 wins in the regular season. However, if we remove the two teams that changed coaches (which we probably should since coaching change represents a great deal of upheaval), the seven remaining teams improved by an average of 1.86 regular season wins. So we know the average team improved by around 1.9 wins, but what if we look at a different kind of average? Yes, I am talking about one of the most unappreciated averages, the mode. Using the mode, we see the average team improved by one game the following season. However, the mode for this sample is only two teams. This low number should set off a sample size alert. If we look at it another way, five of the seven teams improved by at least one game, six of the seven teams won just as many games the following season, and only one team continued their descent. Here is a visual look at what I just wrote about. So the most likely expectation after a ‘Stagnation’ is for a modest improvement the following year. With this in mind, which teams from 2014 ‘Stagnated’? Glad you asked. These four teams declined by an average of three wins in 2013, and Auburn was the lone squad to play in the postseason both years. The good news for this quartet and their head coaches is that they are likely to see modest improvement in 2015. Of course, modest improvement would impact each team differently. An extra two wins would put Auburn in contention for the SEC West title, while modest improvement for the other three teams would get them closer to bowl eligibility. What images come to mind when I mention the word ‘Surge’? Perhaps the word conjures images of a strategy in the most recent Iraq War. Or perhaps a mid-90s soda. Or perhaps it brings to mind an awkward seven foot basketball player. Unfortunately, this is neither a political, soda connoisseur, nor college basketball blog, so when I speak of surges, I am referring to dramatic increases in win totals for college football teams. Of particular interest here is the ‘Second-Year Surge’. Sometimes when a coach takes over a team, his first season is a lost cause as he must deploy players who were recruited for a different system and likely had a different skill set, or in some cases were just plain bad. With his own system in place for a year and some of his own recruits, the team can sometimes make a dramatic leap forward in his second season. Hence the name, ‘Second-Year Surge’. Well, what happens in the third season or the afterglow if you will? 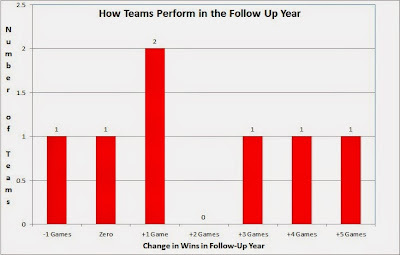 After the team improves, does the arrow keep pointing up, does the team plateau, or do they decline? To answer this question, I looked at the results of all FBS coaches who debuted at a school from 2005-2012 and set the arbitrary definition of a ‘surge’ to an increase of at least four regular season wins. This research yielded 22 teams that surged. They are included with the two tables below listed chronologically (I split the table in two so it would be easier to view). 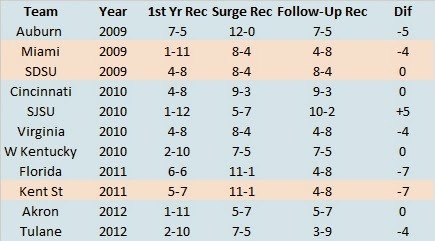 The tables include the record in the coaches’ first year, second year or Surge Year, and third year or Follow-Up Year. The Dif column is the difference in the Surge Year and Follow-Up Year. Kent State, Miami, and San Diego State are color-coded differently because their coaches left after their surge, so they were actually coached by a different guy in the Follow-Up Year. You’re an adult. You can view the table and judge for yourself, but I will throw out some averages for you. 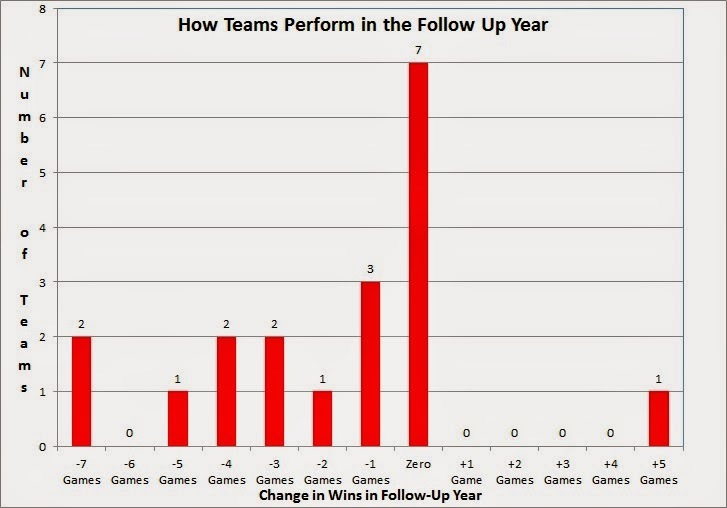 In the ‘Follow-Up Year’, the 22 teams that ‘Surged’ declined by an average of 1.98 wins in the regular season. However, if we remove the three teams that actually changed coaches (which we probably should since coaching change represents a great deal of upheaval), the 19 remaining teams declined by an average of 1.71 regular season wins. So we know the average team declined by around 1.7 wins, but what if we look at a different kind of average? Yes, I am talking about one of the most unappreciated averages, the mode. Using the mode, we see the average team stayed the same the following season. Seven of the 19 teams finished with the same regular season record in the ‘Follow-Up Year’. Three teams declined by either a half or a whole game (a negligible decline in the grand scheme of things). One team declined by two games, two declined by three games, two declined by four games, one declined by five games, two teams declined by an astounding seven games, and only one team improved (but by an amazing five games). Here is a visual look at what I just wrote about. 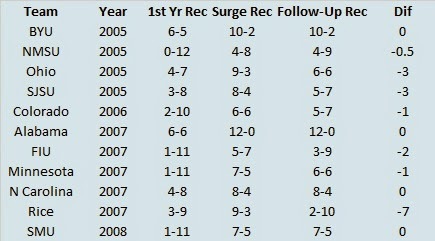 So the most likely expectation after a ‘Surge’ is for either a similar record the following year or a slight decline. With this in mind, which teams from 2014 ‘Surged’? Glad you asked. These six teams improved by an average of almost five wins in 2014, with four playing in postseason games. While it may be tempting to pencil them in for even more success in 2015, recent history suggests we should pump the breaks when projecting their 2015 win total.